Choose the places to visit or let us advise you! París is Paris! What can we say? Art, culture, history, beautiful by day and cool at night. It would take more than a month to fully appreciate the Parisian spirit, the way of life and see everything there is to see. Since the Belle Époque period, artists and the literati have turned Paris into a cultural hub that is recognised world-wide thanks to the luxurious wealth of French royalty. From Leonardo da Vinci to Picasso, the majestic museums and superb picture galleries have gathered together the most stunning collections of artistic wonders that are the result of man's ingenuity. The French capital deserves to be "experienced" rather than just visited and often tourists set off on a tour they have organised themselves only to discover when they return home that they have missed some of the best bits! The city is too large and too beautiful for this mistake when it is possible to have a unique service at your disposal: An English-speaking Guide in Paris. Visit Paris in complete comfort with a carefully planned schedule covering the days of your visit and the important places you want to see in the company of an experienced guide, the perfect way for any type of tourist to see the city properly. How many visitors can speak the language correctly? The French do tend to insist on speaking only French and few city residents are as fanatical about their own language as the Parisians. The guide service that is available enables the client to choose a guide who speaks English and who will open your eyes to the secret wonders of the most typical and beautiful sights of the French capital. There is also the additional option of including a private car service with a driver (who would just be responsible for driving the car not for guiding). Visit Paris in complete comfort with a carefully planned itinerary covering the days of your visit and the places you want to see in the company of a professional guide, is the perfect way to see the city for any type of tourist. Even if you only book a single tour (for the duration of your choice), you will still have the opportunity to ask your guide for any additional advice you may need. In fact, it is also possible to ask for advice regarding the places to visit on other dayson which you are not using the guide and you will also be able to get some information regarding typical restaurants that are worth trying.For this reason, our advice is to book your guided tour on the first days of your stay in the capital so that you can get the guide's suggestions as to what to visit on the days when you are not using this service. And, in addition to this, how many of you speak perfect French?It is a well-known fact that the French are very proud of their language and will often insist on only speaking French. This is another good reason for deciding to choose a guide service in English because this will take care of any communication problems. Forget the stress of trying to get your bearings in an unknown city: let yourself be shown around by an expert local guide.The Guide Service, which can be booked on this page, enables the customer to experience the very best that's on offer during their visit with the best local English speaking guides in Paris. Your guide will be your very own "Cicerone" (the English publisher specialising in guide-books) in the most beautiful and typical locations in Pariswith the option to add a private car service (with a driver who would only be respondible for the driving - not for guiding). For more information, visit the web page: Tour Paris by car. The convenience of a guide service in your language, coupled with the freedom of being able to choose what, where and when you want to use the guide serviceis the perfect solution for visitors to Paris. In fact, on the booking form you can: choose the duration of your tour, personalise your itinerary(or let yourself be advised by the experts), choose the time you want and a meeting point of your choice.If you wish, you can also request that the guide comes to meet you wherever you are staying. Just state your preferences on the booking form and we'll take care of the rest. What can I visit with a local guide? The tour proposed in the service " an English Guide in Paris" also allows for guided tours of Montmartre, La Défense and Le Marais, Île de la Cité and many other itineraries which can be chosen in conjunction with the customer such as the world-famous Museum of the Louvre. Montmartre is an elevated area of the city (mostly on a hill) that is situated to the north of this famous capital and is visited by millions of tourists every year. Then there is also the Basilica of the Sacré-Cœur which, until the end of the Belle Époque era was also used as a theatre and the area was a popular hub for some of the most famous bohemian artists who lived in Paris. Through these streets, artists of the calibre of Van Gogh, Modigliani and Picasso were a familiar sight and have left indelible clues to their passing in the capital's most famous neighbourhood. The area of La Défense has a more recent history and is less typically Parisian but, that doesn't mean that the area isn't still worth a visit. As one of the largest business districts in Europe, with its eye-catching skyscrapers, this area of the city is home to the head-quarters of some of the world's largest companies. There is also an infinite number of shopping centres and trendy neighbourhoods with an array of futuristic buildings. You will be surprised by their enormity and their quirkiness. This neighbourhood is also home to a variety of works by contemporary artists which include some vast statues and of course, the famous Grande Arche of La Défense, a truly spectacular architectural work. Also, why not pay a visit to the Le Marais district? This is the grand Drawing Room of Paris, an area that is still home to some of the most beautiful and historic buildings which belonged to the city's aristocracy. It is also the site of several important museums, such as the Picasso Museum, for example, fashionable shops, Victor Hugo's house and historic squares such as the Places des Vosges and one of the largest Jewish communities in Europe where you can sample traditional dishes from the Jewish culture. And to finish, how could you miss out on a stroll along the streets of the Île de la Cité? In this true and beating heart of historic Paris you will find the Hotel de Ville, the Municipality, the Seine and the Cathedral of Notre-Dame, the Palace of Justice which was the residence of several of the French kings who occupied the Palace in one form or another for several centuries. Then there is the famous triangular sqaure, Place Dauphine, and of course, the world-famous Louvre in addition to so many other wonders that can be admired across the French capital. Why should you choose a local guide? Free yourself from having to worry about being able to communicate in French. 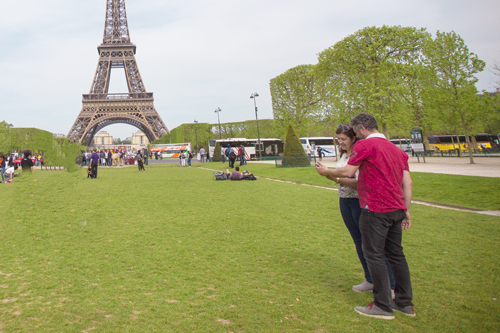 Visit Paris with a guide who speaks your language! A tour with an English-speaking Guide in Paris will undoubtedly enrich your stay and transform it into an unforgettable experience. You can do all this in complete comfort, with an English-speaking guide or maybe your own driver and with an itinerary that can also have some input from the client. Book the English-speaking Guide Service in Paris and we'll take care of the rest! Visit neighborhoods and / or inside attractions. NOT shared with others and skip the queues. Cost divided by participants, example: € 13 per person in 10. The unofficial guide can not access the attractions. However, visit the best places (even secrets) normally unknown to tourists.